This is what my childhood bedroom looks like now. 1. What is that stain on the carpet? I may not be the neatest person, but I would never let that happen. 2. I was going to diss the light fitting on the wall, but I have a horrible suspicion it’s mine. It’s the ’80s peach and black that gives it away. 3. 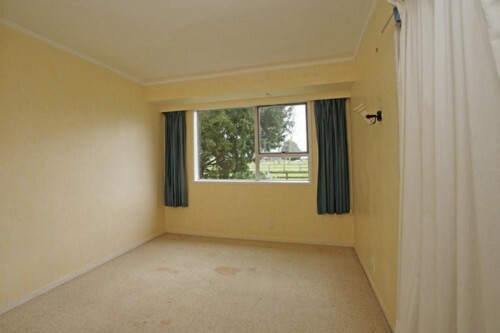 But, bloody hell, what is going on with that yellow wall colour and matching carpet? The last time I redecorated – 1991 – the walls were white and the carpet was a light woolly colour. It was awesome, going for an urban apartment vibe, at odds with the view out the back window. And the previous redecoration, in 1986, saw pale pink wallpaper with diagonal stripes. Which is what happens when an 11-year-old girl gets to choose her own wallpaper. 4. See the curtain on the far right? That’s the wardrobe. We added on about a metre to the bedrooms, and so the wardrobes were embiggened to fill the gap. The intention was to replace the old single wardrobe door with a pair (probably those ones with horizontal slats, that would have been swell), but the house ended up being sold without doors on the wardrobes. Hilariously, the new owner/s have kept them doorless for almost 20 years. 5. The house is for sale, and it’s weird looking through the pics. The new owners have opened up some spaces and made it flow better, but there’s remnants of some really odd decorating choices that makes me feel a whole lot better about what, until now, I thought was my amateur sense of interior decoration. And the carpets are filthy.